Tom Beier, one of nine children, seven of whom played collegiate football, found himself having to carry on his family's tradition of football excellence. He not only achieved that goal but in the process gained himself a reputation as one of UM's best defensive backs ever. 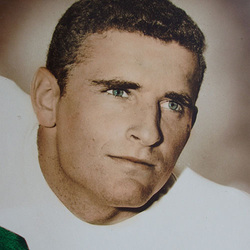 Transferring to Miami as a relative unknown for his junior campaign, Beier came on and became the Hurricanes most deadly defensive back in that 1965 campaign. That season Beier slammed 69 opponents to the ground, setting a record for most tackles in a single season by defensive back. In Beier's second and final season with the Hurricanes, the team rolled to an 8-2-1 record, culminating in a 14-7 victory in the Liberty Bowl, their first post-season win since 1951. Beier also went on to be named an All-American selection in that 1966 campaign. Tom Beier went on to be Miami Dolphins 10th round pick in 1967 and played two seasons with the Dolphins.